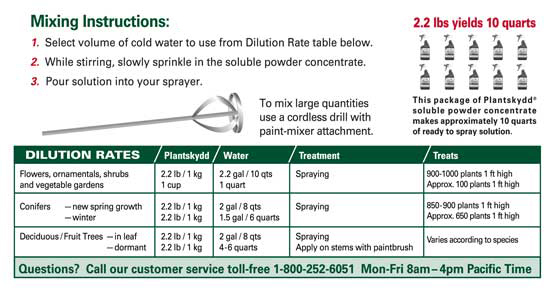 * a paint-mixer stir attachment for cordless electric drills is very effective when mixing Plantskydd powder concentrate in 5 gallons pails of water. * high speed mixing and/or prolonged agitation will produce excessive foam. * If anti-foamer additive is used, add it to mixture just before pouring into backpack type sprayers. * once mixed, strain the solution through the strainer included in packaging to remove any undisolved particles. For Deer & Elk – Dip/Spray mainly tops of plant — until wet but not dripping. For Rabbits – spray stem and lower leaves. Ornamentals — spray mainly on leaves of plants until wet – avoid blossoms. Needles/leaves darken temporarily after treatment — original color returns in 18-36 hours. Apply at above freezing temperature. Avoid application in direct hot sunlight — for best results, apply in early morning or late afternoon. Treating Pine seedlings during bud flush is not recommended (OK before/after bud flush period). Allow to dry 24 hours before watering plants. Use mixed solution within a few days. using a back-pack-sprayer for large scale, commercial applications. Video Produced by: Bensell Greenhouse, 5720 Dorr St., Toledo, Ohio Bensell not only sells Plantskydd Repellents, their Landscaping business also applies it for their customers’ properties. Seeking more information about our products? See how our Animal repellents have worked for protecting grower’s agricultural lands, as well as detailed Field Trials conducted by Vineyard and Nursery owners who use Plantskydd products for reducing damage to their crops. For more information please watch the following videos on How to best use Plantskydd Animal Repellents.